Shortest way to the Moon! Engineers weighing the aerodynamic problems of space flight—or combustion problems of vehicle propulsion—are now solving many of the most complex mathematical computations in a few minutes, right in their laboratories. This has been made possible by GEDA-—the Goodyear Electronic Differential Analyzer — versatile electronic analyzer that solves complex problems and saves engineering man hours. For example, GEDA can compute a rocket’s trajectory in space—or simulate a proposed engine control—in a matter of minutes. In the face of rising research costs, GEDA can be used by laboratories and manufacturers to develop improved products and methods — simulate control systems for machines and automatic industrial processes. And mark this: with GEDA—design parameters can be established and new avenues of investigation explored even before actual development work begins. The Goodyear Aircraft Corporation—operator of one of the world’s largest computer application laboratories —has been building GEDA’s for more than five years. Write today for details on the new Model L3 and N3 GEDA’s—most advanced models yet offered for both government and commercial applications. Its future industrial applications are limited only by the ability of engineers and design men to evaluate engineering problems in the light of precision simulation techniques. Address: Goodyear Aircraft Corporation, Department 65, Akron 15, Ohio. 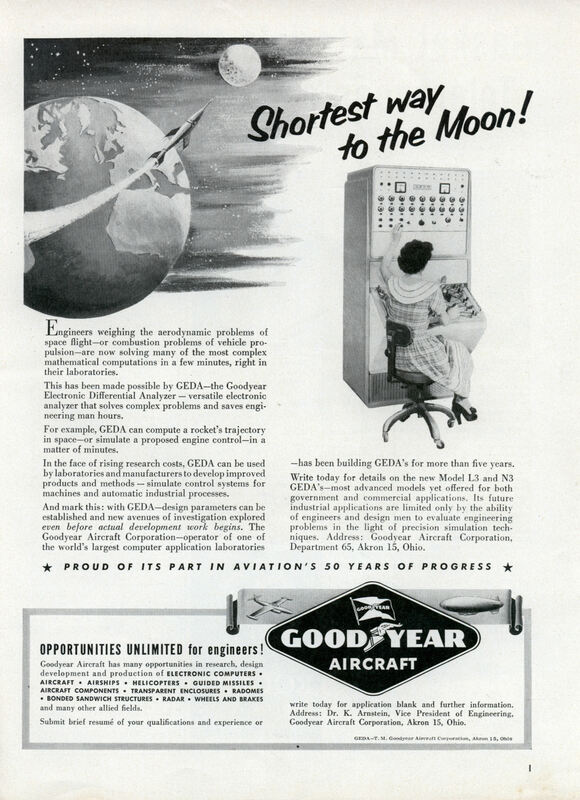 Goodyear Aircraft has many opportunities in research, design development and production of ELECTRONIC COMPUTERS • AIRCRAFT • AIRSHIPS • HELICOPTERS • GUIDED MISSILES • AIRCRAFT COMPONENTS • TRANSPARENT ENCLOSURES • RADOMES • BONDED SANDWICH STRUCTURES • RADAR • WHEELS AND BRAKES and many other allied fields. Submit brief resume of your qualifications and experience or write today for application blank and further information. Address: Dr. K. Arnstein, Vice President of Engineering, Goodyear Aircraft Corporation, Akron 15, Ohio. write today for application blank and further information. Address: Dr. K. Arnstein, Vice President of Engineering, Goodyear Aircraft Corporation, Akron 15, Ohio. Goodyear made non-lighter-than-air aicraft? Not just tires and radar? I’m with Toronto: Goodyear made non-lighter-than-air aircraft? Didn’t know that. Something about being able to use a slingshot to bring it down doomed the project. However, if they’d followed up like the Mars Flyer experimental wings, it might have brought pilots home. With this article we witness the turning point, the exact time when the propagandists took over and the interests turned from resolving domestic and farm problems to the nonsense of space travel! 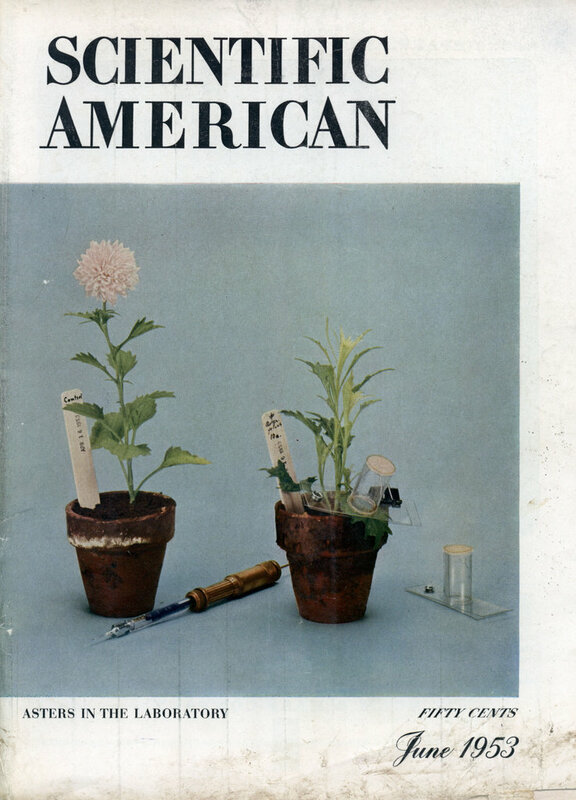 Modern Mechanix – essentially a DIY styled domestic problem resolver magazine for the masses turns to the asinine notions of space travel as a serious endeavor for Americans and not just science fiction! This is the exact point America broke loose from her tracks and lost its firm grip on reality! We walked on the moon, yet face over 10% unemployment, and worse yet, unemployability for a larger part of our population! We have cameras on Mars, and still struggle with racism, hunger in the streets, cancer, corrupt politics and crime! Time is now for America to resolve its practical every-day problems and stop with this space travel nonsense! Uncle B: First of all, Pop (you have got to be in your sixties) it’s an ad offering employment not an “article”. The way folks toss around the word propaganda I have to wonder if they even know what it means. Scientific and medical research : This subcategory consists of the general science, space, and technology function (250), and the health research and training subfunction (552). Yeah, that mean old space program with weather and communications satellites, who needs it? You’re right, because racism and cancer exists we could have done without pictures from Mars. Just lock yourself in your house and don’t go out because the world is such a terrible place. I feel sorry for you actually.